This year, the Vancouver International Wine Festival, which ran from February 24 to March 4, celebrated its 40th edition with 51 events including tastings, seminars, and dinners. The festival showcased wines from 15 countries, with the spotlight on Spain, who had 38 wineries at the festival offering tastings, and Portugal, who had 20. Seven years ago I attended the The Bacchanalia Gala + Auction at the Fairmont Hotel Vancouver—a five-course dinner with nine wine pairings and a silent auction of rare wines—as someone’s date and had a really wonderful time but have not attended since. Each year, the festival would come and go and I’d wonder about the tastings and events but I felt really shy about attending; I had this notion it was for people who had a far greater knowledge of wine than I did. This year, however, I decided to take the plunge and started with the event the festival suggests—the International Festival Tastings. So I grabbed a girlfriend and together we attended the Thursday evening tasting and I went again solo on Saturday afternoon, and even by attending the event for two days, I only made the slightest dent into the 750 wines that were available for tasting but learned a lot about wine and my tastes nevertheless. When I walked into the Vancouver Convention Centre and saw the amount of wines available, it was hard to know where to start. Regrettably, I didn’t come up with much of game plan before I arrived and quickly became overwhelmed. At times, I became distracted by the colourful characters swirling reds in the glasses (my girlfriend said the event felt like a mix of going to the opera and a trade show; however, Saturday afternoon, I found there to be a different crowd who were interested in wine more casually). Anyway, I once I began tasting some of the wines, I did regain focus. With the theme this year being “Celebrating Spain & Portugal” there were a lot of quality producers with wines from the various regions of the two countries, including a very reasonably priced wine from one of Rioja’s grandest houses, CVNE (Compania Vinicola del Norte del Espana). The Cvne Gran Reserva 2011 is 85% Tempranillo, 10% Graciano, and 5% Mazuelo and was glorious with flavors of blackberries, cranberries, and spices, and incredibly reasonably priced for what you get. Unfortunately, I didn’t spend enough time in the Spain and Portugal section because it was incredibly crowded and busy, and ended up gravitating toward the French, Italian, and Chilean section. I have listed some of my reasonably-priced favourites from what I drank over two days. However, I must make a disclosure: I’m heavily biased toward French producers. Wines from Bordeaux, Burgundy, Beaujolais, Rhône Valley…I think such preferences took root on a school trip to France (with Rebecca!) when we were 14 years olds and visited a vineyard in Burgundy. Also, remember, I’m not an expert, but a wine enthusiast, but after attending the tastings, I will say my interest has been piqued — I’m now listening to wine podcasts and flirting with the idea of taking my WSET Level 1 this spring. 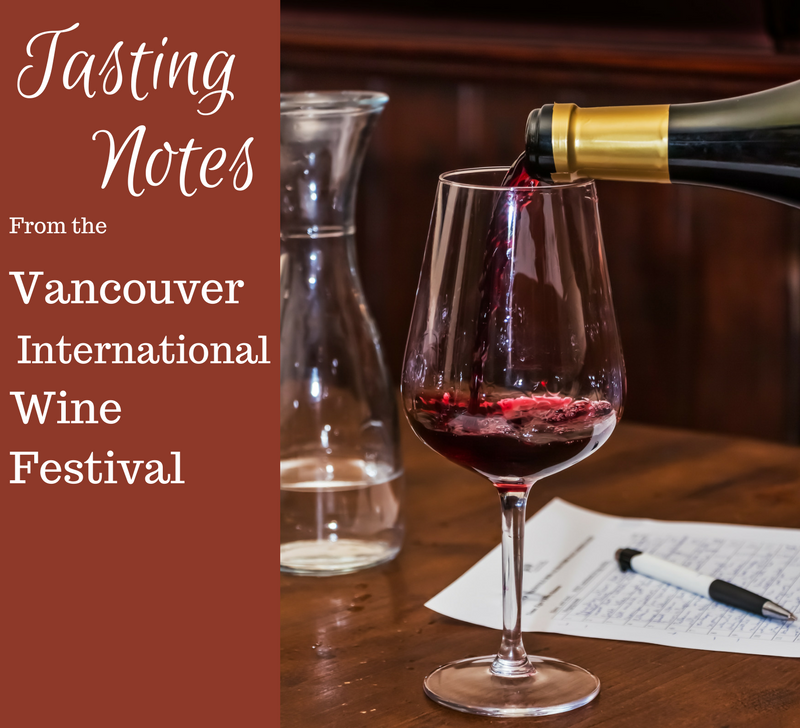 So I definitely recommend people interested in wine to attend the Vancouver International Wine Festival as it’s a great starting point because of the quality and quantity of wines you’re exposed it. Notes: Fantastic value for a Bourgogne Blanc. Light, creamy, fresh, with great balance. Notes: (Organic) Medium-bodied. Silky, with licorice and and spice on the palate. Great value. Notes: (Organic) Wine Spectator gave the 2015 vintage a score of 91. Really good value for Châteauneuf du Pape. Red licorice on the nose. Cassis and plum on the palate. Anything by Jean-Luc Colombo is highly recommended. Notes: (Organic) I don’t know much about wines from Provence but this was delightful rosé. Light, rose gold-coloured, dry. Floral nose with pink grapefruit and peach on the palate. Notes: All the reds produced by Undurraga I tried were incredible and of outstanding value. I didn’t quite catch the vintage but anything from their vineyards would be great. Notes: Anything by Santa Ema is something to look out for. These were some of my favourite reds and are of excellent value. Notes: The one BC table I stopped at (I’m a huge BC wine love but since there were so many wines from around the world, I didn’t spend much time in this section); I thought Riesling was a fun, unique, and tasted like summer to me. Throughout the year, follow the Vancouver International Wine Festival on Facebook and Twitter for the latest wine updates and events. Michelle received media passes for Vancouver International Wine Festival events. Views and opinions are her own.